Gripsweat - VG++/NM- BEAUTIFUL!! 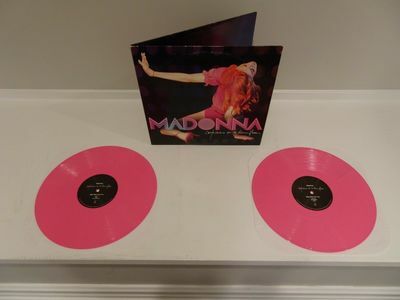 Madonna Confessions On A Dance Floor LP UNMIXED PINK VINYL! PLEASE NOTE: I WILL ONLY GRADE AN OPENED LP NEAR MINT (NM) IF I CAN GUARANTEE IT HAS NEVER BEEN PLAYED (i.e. I AM THE ORIGINAL OWNER). OTHERWISE, NEAR MINT MINUS (NM-) IS THE ABSOLUTE HIGHEST GRADE I WILL ASSIGN AN OPENED LP. WILDLY rare first US pressing on pink vinyl from 2006 issued on Warner Brothers. Each copy was individually hand numbered in a small white box in the lower right hand corner on the rear and this one is number 1659. Please note-this is NOT the far more common unmixed European pressing from the same year OR the recent 2017 reissue. This is the real deal.